It's the last day of the semester before Christmas Break. This means that my day pretty much consists of waiting impatiently for students to take their semester tests followed by a frenzy of grading to get the tests into the gradebook. We're on a block schedule for our two days of semester tests, so I had an extra long planning period this morning. 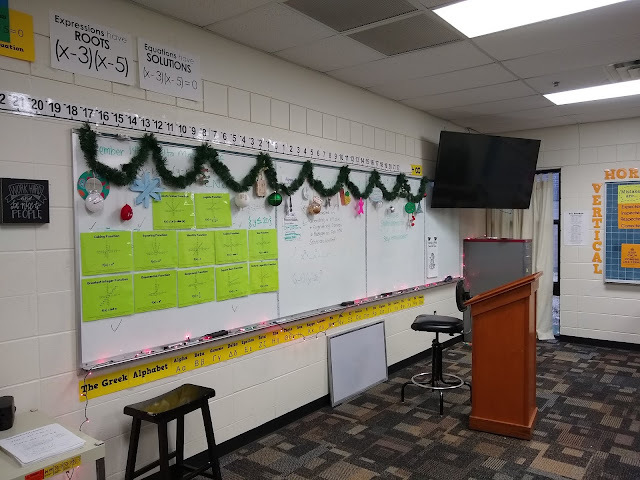 I used part of that time to un-decorate my room for Christmas since I figure that will be the last thing I want to do when I come back in January. I'm a bit sad to see the Christmas decorations go because they weren't just any ordinary decorations. They were vocabulary ornaments created by my Pre-AP Algebra 2 students. This project was inspired by Toni Madison, a middle school math teacher and blogger. 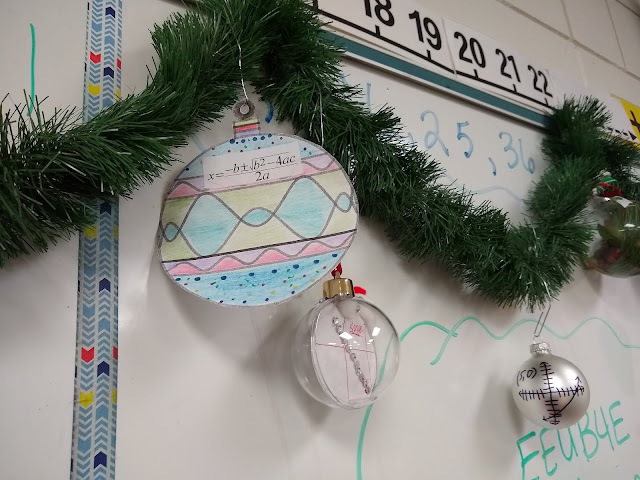 You can check out her original post about the ornament project (plus lots of other Christmas ideas) here. I used the rubric she shared on her blog with my students. The only real thing I had to prepare for my students was a list of vocabulary words we had learned this semester for them to choose from. I didn't have an extra Christmas tree for students to hang their completed ornaments on, so I improvised by hanging garland around the room. This ended up working really well, actually, because students were able to easily see EVERYONE's ornaments. I only did this with my Pre-AP Algebra 2 classes. 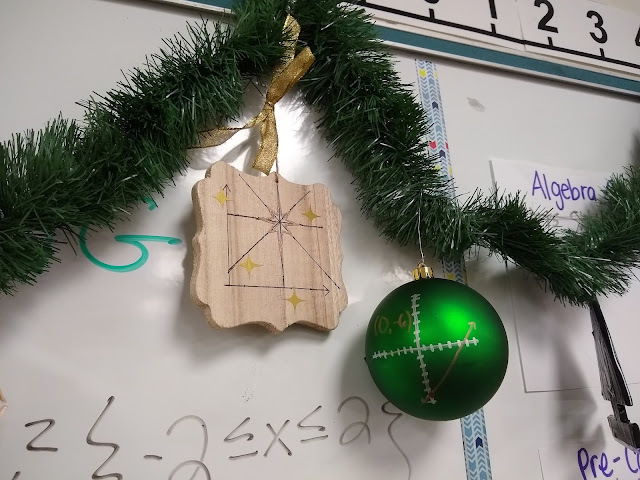 My on-level Algebra 2 classes were actually jealous once they saw all the ornaments that my other classes had created. Why didn't we get to do that?!? Since I did do this with Pre-AP students, this assignment was completed entirely outside of class. Students provided their own supplies. If I were to do this with on-level students, I would probably give them time/access to a limited number of supplies in class. 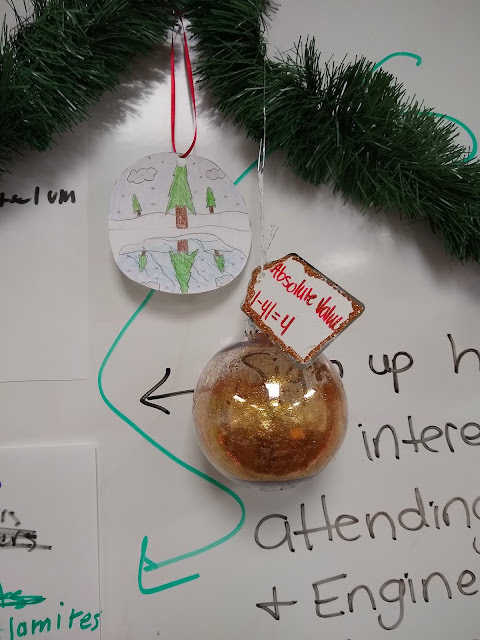 One of my favorite aspects of this project was that students had to write a paragraph explaining the meaning of their vocabulary word and how their ornament reflected this definition. I would definitely NOT do this project without the written aspect. There were a few ornaments that I was unsure what word they represented UNTIL I read the paragraph. Then, it made total sense. Next year, I would make a few changes to this project. 1. I thought I had a brilliant idea of creating a google doc where students could sign up for whatever vocabulary word they wanted to do. This ended up being a disaster. Students were erasing each other's names from the google doc, and it took way too long for them to stop trying to sabotage each other and choose a word. I think I might just pass out vocab words next year and let them trade with a friend if they don't like their word. 2. I definitely want to introduce a brainstorming aspect to this project where they complete an intermediate assignment where they have to write down the definition of their vocabulary word and create a rough draft of ideas for what their ornament might look like. Some of the ones that didn't make it into the close-up pictures were a bit lacking on the creativity side, and I could tell they were most likely done at the last minute. 3. A lot of the vocabulary words we use in Algebra 2 overlap with vocabulary words from previous math courses that students have taken. 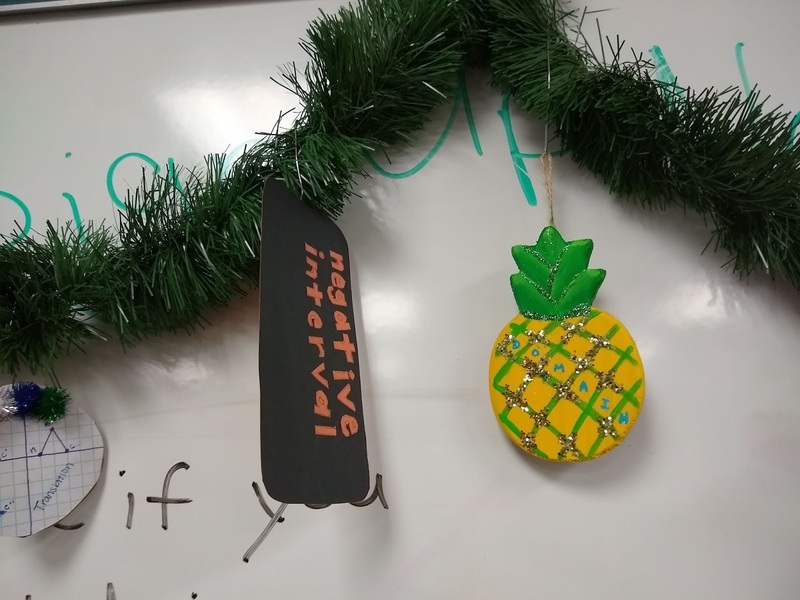 I didn't do the best job of emphasizing to students that they needed to make their ornament reflect the definition we learned in Algebra 2. 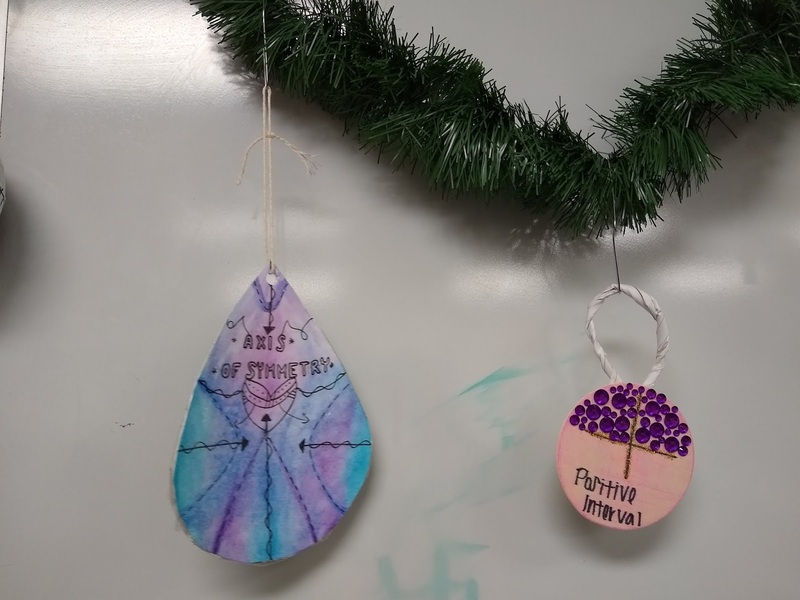 Several students took a much more geometric approach to their vocab ornaments than I would have liked to have seen. I need to emphasize this next year. I think doing the above idea will help take care of this as well. 4. I think I would also start this project SOONER next year. Originally, I had planned on assigning it right after Thanksgiving. But, life got crazy, and the deadline ended up being a little too close to comfort to the deadline to get semester grades in for exemptions. Plus, the sooner we get the decorations up, the longer we can enjoy a Christmas-y decorated room. 5. 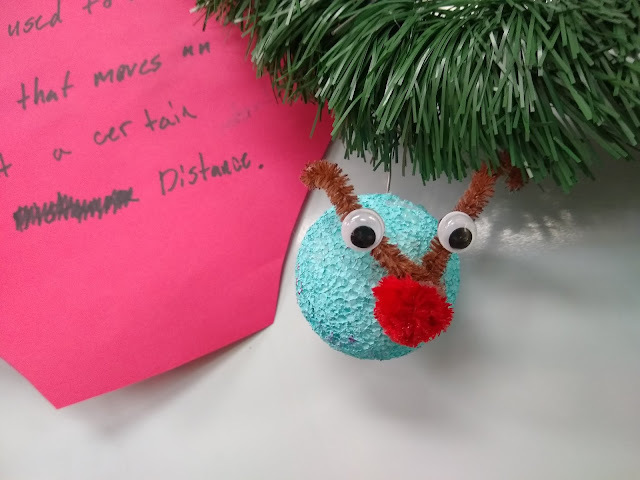 The last change I would make is to have students present their ornaments to the class with a quick presentation. I think this would increase student buy-in and end up producing better projects. It's the LAST Monday of the semester here, and let's just say that I am ready for 3:30 on Wednesday to arrive so that I can officially be on Christmas Break. The husband has finished his finals already and is enjoying a much deserved break from grad school, so I am ready to join him in not having to set a morning alarm. 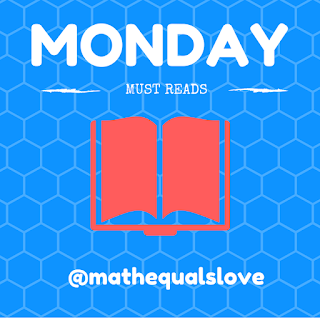 Seeing that it's a Monday, I thought I would put together a new volume of Monday Must Reads to give you some ideas to either get through the last few days of the semester or ideas to kick off the new semester once you return. These are my favorite posts of late from Twitter. I absolutely love this systems-based WODB prompt from Tori Cox. Check out this beautiful area task from Math with P. Nik. Mr Nik also shares a winter-themed puzzle. 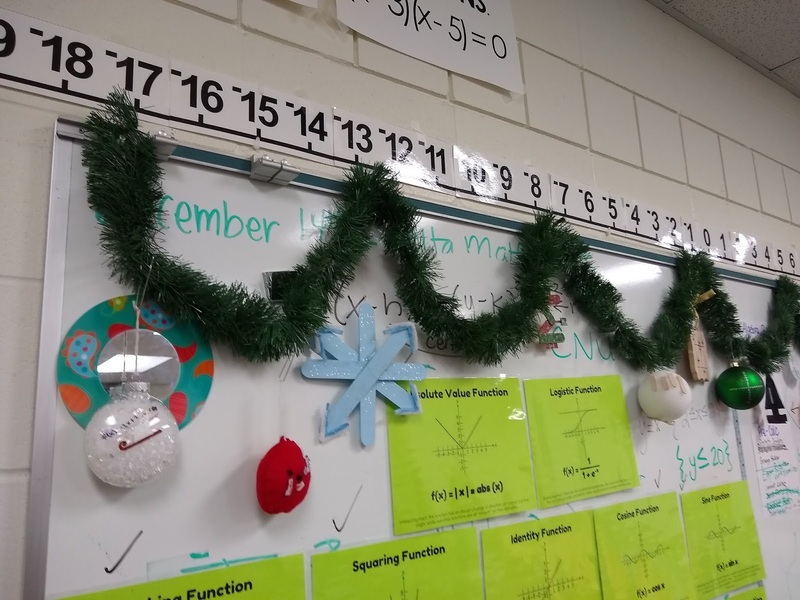 Kelly Loschelder shares a great idea for multiplying polynomials involving polynomial necklaces. LOVE this idea! Ms. Scott inspires with the simple but brilliant idea of giving students cards for voting on the answer to a problem. Why did I never think of this for function or not a function?!? 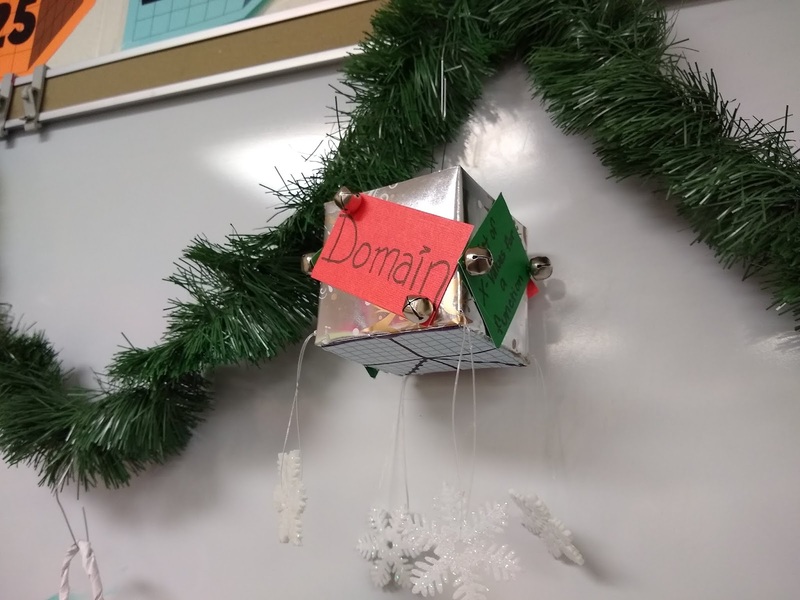 Mrs Strole inspires with this project that combines art and architecture. 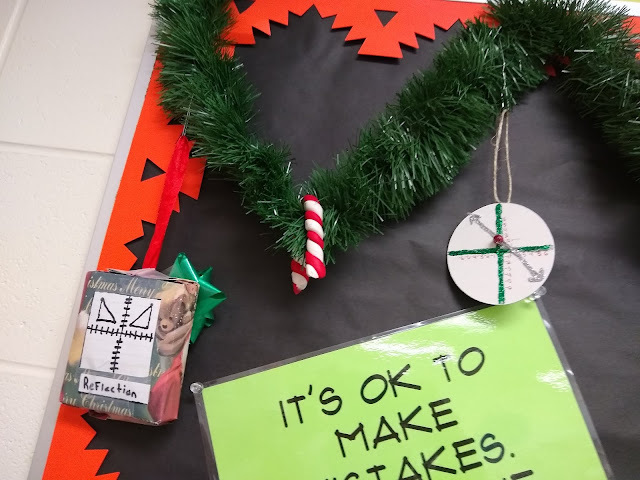 DCDSB shares a creative ChristMASS problem. How adorable are these pancake proofs from Elizabeth Nixon?!? I love how Ms Kroeze presents compare and contrasting equations and inequalities as a battle! 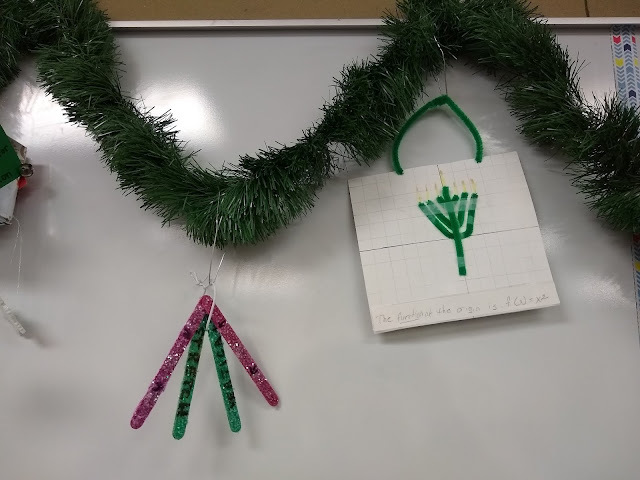 Paul Jorgens shares a beautiful, Christmas-themed Desmos Marbleslides challenge. Love tea? Check out how Amy Herzog turned a cup of tea into a math lesson. Hymie Holmes shares some beautiful area quilts that students created. Clemens Science inspires with three beautiful Christmas trees full of biology-themed ornaments. Beautiful! Jen Silverman shares a great picture to use as a proportional reasoning task. Talesha Couillard shares a similar proportional reasoning task. Peter Drysdale shares a great task for working with adding radicals. Mark Kaercher adds the twist of cutting to the Quarter the Cross task. I could totally see myself laminating these and making them into Christmas ornaments! 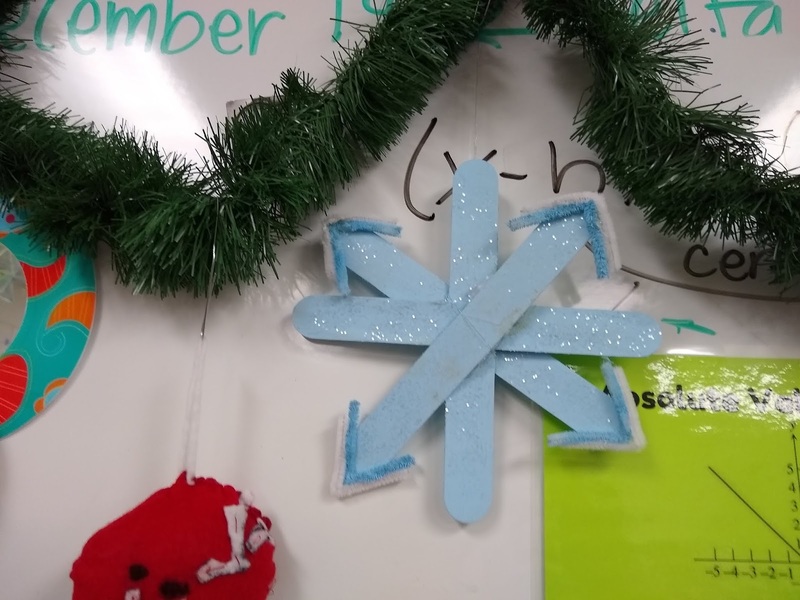 I love this snowflake WODB task from NOMA math! 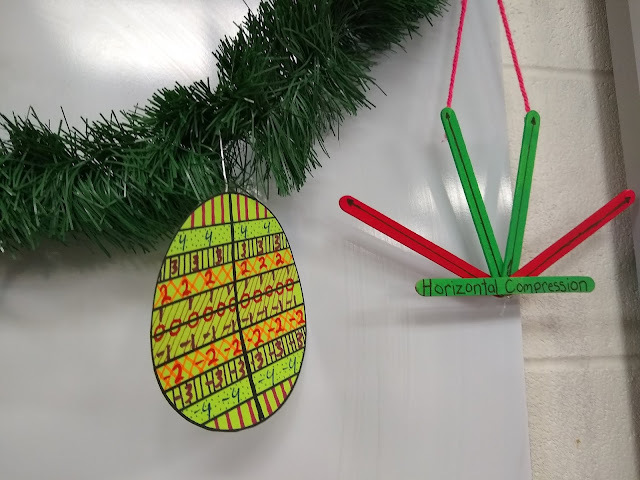 Jackie Bly shares the oh-so creative idea of having students use equations of circles and 3d printing to create custom designed bubble wands. This is the type of lesson that students would never ever forget! I absolutely love this photo that Hedge shared of some Christmas trig artwork that she spotted in a school she was at. 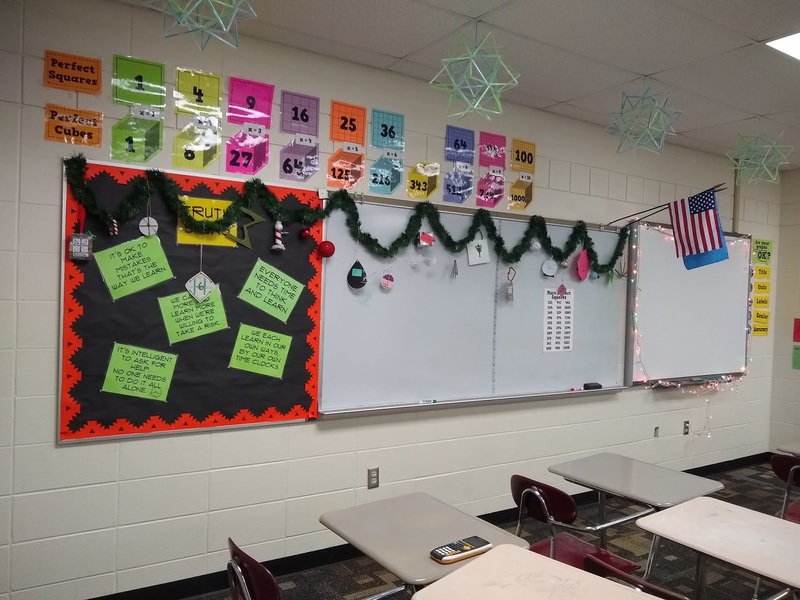 Check out how Brittany Ryan celebrates student achievement in her classroom. I love the emphasis on both success on the current test and improvement over the previous test. I love how Tony Lipscomb displays his problem of the week. I also like how there are multiple levels available to differentiate for all students. 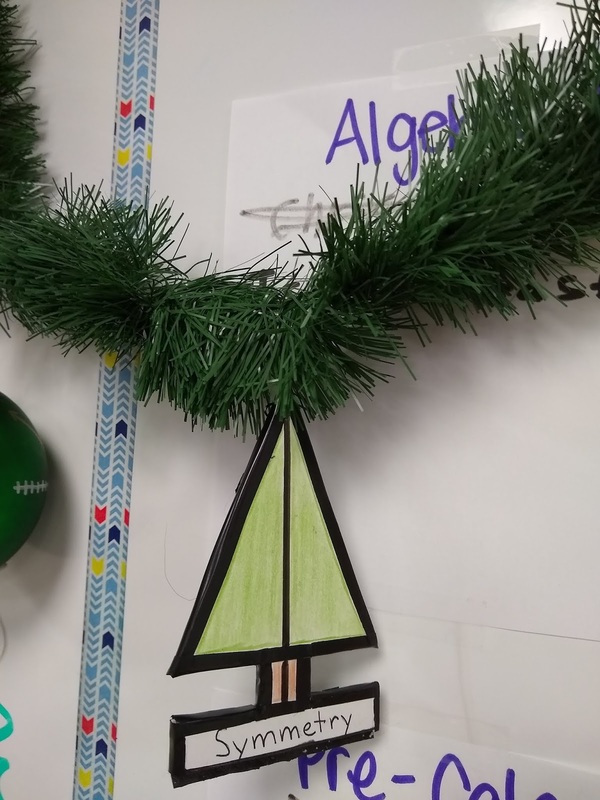 Melissa Arsen makes the pythagorean theorem come to life by engaging students with mini golf. 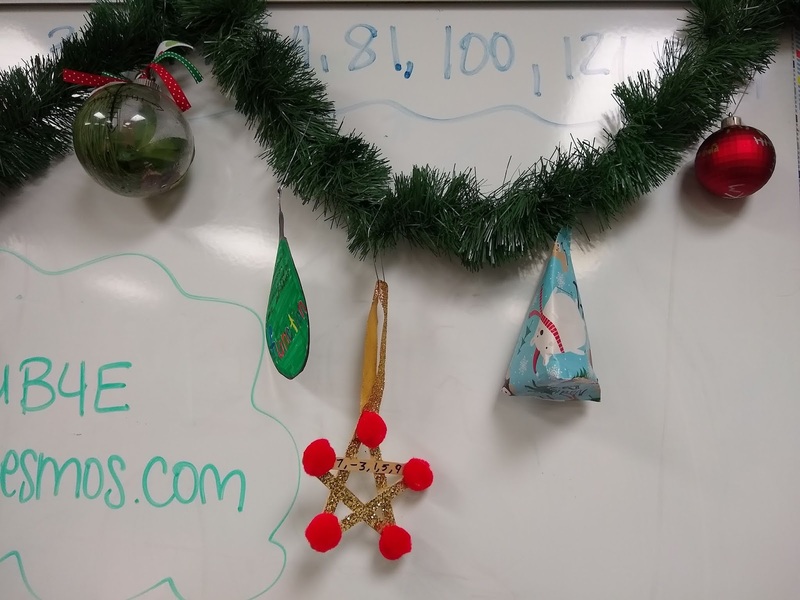 Lauren shares a fun fact about balancing birds and triangle centroids. Emily Parker shares a great image to motivate systems of equations. 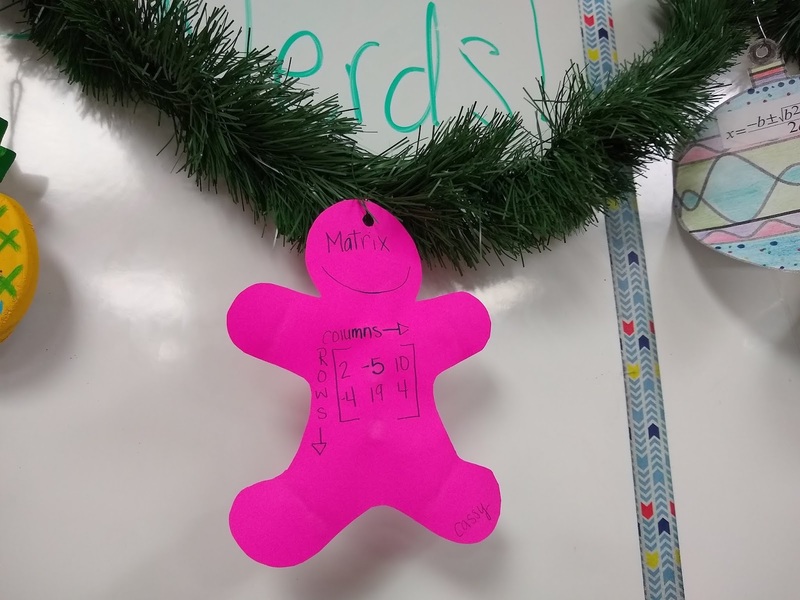 Torri Martin shares a great business card/elevator pitch idea that could be applied to so many different concepts in math and non-math classes alike. I love how this activity really brought out student creativity! Martha Mulligan shares some funny math pick up lines that her students came up with. This temperature functions project from Cassandra Valenti looks interesting! 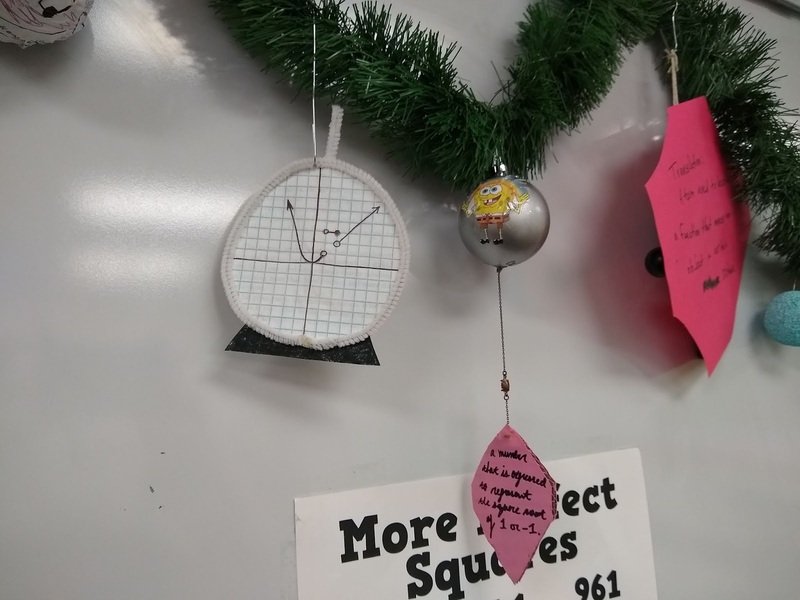 Phil Smith impresses with his math-y Christmas gifts. Ethan Weker shares a WODB for exponents. I love how this bulletin board from Elizabeth Streat embraces math vocab while recognizing all of the languages spoken by students. How cool would this be to study and examine for patterns throughout the year?!? 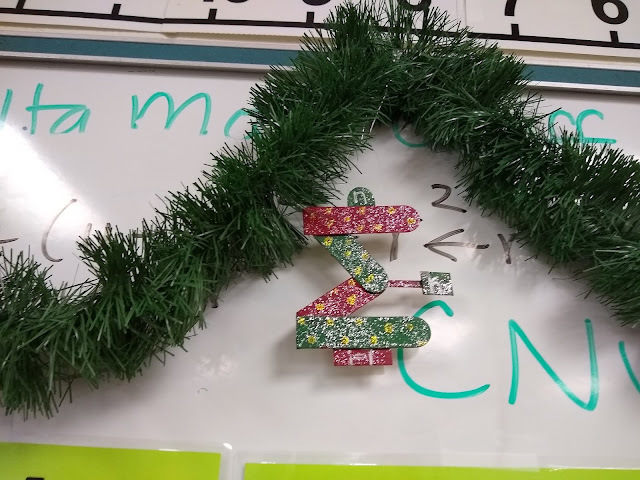 This exponent task from Jo Morgan is beautiful! Jamie Back shares some awesome 3d printed vases designed by her Pre-Calc students. Hannah shares a new-to-me math joke. Sam Hilkey shares a new logic puzzle involving fractions. Courtney Clark uses her growing infant to provide her students with some real-world data to analyze. Tammy Howell Ramirez shows off some great polar artwork created by her students.